Andrew Manze has been chief conductor of the fine NDR RadioPhilharmonie in Germany since 2014. 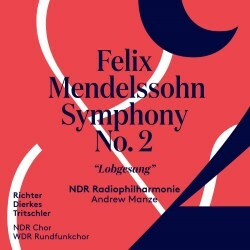 This issue completes his set of the five Mendelssohn symphonies with his orchestra. It isn’t entirely surprising that he has left this symphony to last, for, as Jörg Peter Urbach points out in his excellent booklet notes, Symphony no.2 is a singular work. What exactly is it? he asks - “A symphony? A cantata with an instrumental symphony? A symphony-cantata? Or a combination of a symphony and oratorio?” Well, it is all of those things; its numbering is misleading too, as it is in fact the fourth of the five mature symphonies (not the last as the notes tell us), with only the ‘Scottish’ Symphony, no.3, composed after it. It would be easy enough to cite Beethoven’s ‘Choral’ Symphony as its antecedent, but Beethoven’s finale is quite a short affair compared with the nearly 40 minutes’ worth of vocal music that Mendelssohn gives us. The 1840 occasion for which this work was commissioned was the 400th anniversary celebration of the invention of printing by Johannes Gutenberg. This took place in the ‘book city’ of Leipzig, such a historically important German city, and where Mendelssohn was currently based with his Gewandhaus Orchestra. His idea was to select passages from the Old Testament to suggest the progress from darkness to enlightenment set in motion by Gutenberg’s Bible; and the resulting solo and choral movements would be prefaced by three symphonic movements. The trombone theme that announces the first movement is a ‘motto’ that recurs throughout the symphony, returning majestically to round off the final conclusion. I was interested to compare this new Manze recording with that of Edward Gardner with his CBSO forces, published just a few years back - and frankly, I couldn’t split them! Both have superb orchestral playing and fresh, youthful choral singing, though the German chorus, for me, has the tiniest of edges, with its unflagging energy and tone quality. Manze has the wonderful Robin Tritschler as tenor soloist, and his singing is, as ever, characterised by sincerity of utterance and great beauty of tone. But then Benjamin Hulett is quite superb too, on Gardner’s Chandos recording! If anything can decide it for me, it would be the pairing of the two Bevan sisters, Sophie and Mary, in the Birmingham version; they are simply sublime, and add a radiance to Gardner’s reading which is very special. Gardner’s cast and chorus sing in English, whereas Manze’s version is in the original German. Enough of odious comparisons! The best bet is to have both these outstanding versions on your shelves. Certainly Andrew Manze’s new recording is a superb one, which does full justice to Mendelssohn’s unique work.